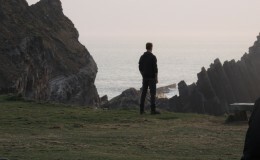 In April 2015 the BBC, in conjunction with AMC and The Ink Factory returned to Hartland Abbey to film an adaptation of John Le Carre’s ‘The Night Manager’. 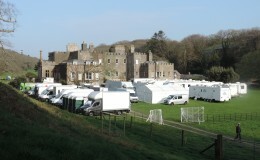 The lawn was used as the Unit Base for a week whilst filming went on in Hartland village and down at Blackpool Mill Cottage, the location for Lanyon Rose, the cottage in Cornwall in the book. A huge amount of support vehicles filled the whole car parking area; make up, costume, catering, cameras, lighting to name but a few with winnibagos for production and the actors. The BBC, the actors and production could not have been more considerate, especially to the Hartland Abbey visitors who managed to get a peek of the filming. Starring Hugh Laurie as Richard Onslow Roper, Tom Hiddleston as Jonathan Pine and Olivia Colman as Burr, it is scheduled to be shown from February 21st 2016. We think the Hartland and Blackpool Mill scenes will be in Episode 2. The Hartland Abbey Estate has been used extensively over the past sixty-five years with’ Treasure Island’ (1951), ‘Water’ ()1984 with Billy Connolly, Michael Caine, George Harrison, Eric Clapton, Leonard Rossiter amongst others, ‘The Shout’ (1977) with Susanna York and Alan Bates, ‘An Element of Doubt’ (1996) with Nigel Havers and Gina McKee and, more recently, Andrew Davies’s production of Jane Austen’s ‘Sense and Sensibility’ and Rosamund Pilcher’s ‘The Shell Seekers’, amongst others. We plan to have a small exhibition this summer on ‘Filming on the Hartland Abbey Estate’ for visitors to the house. 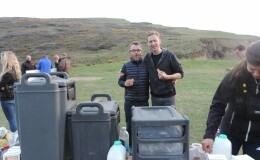 Just a few pictures taken during filming of The Night Manager…..